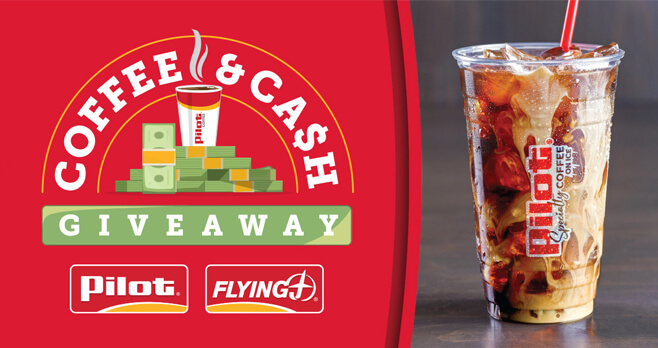 Pilot and Flying J are giving away coffee and cash during the Pilot Flying J Coffee and Cash Giveaway. Fill out the entry form online at coffeeandcashgiveaway.com and you could win a $10,000 check or free Pilot Coffee for a year. Who Can Enter? The Pilot Flying J Coffee and Cash Giveaway is open only to legal residents of the 48 contiguous United States and the District of Columbia who are at least 18 years old at the time of entry. What Is The Sweepstakes Prize? The Grand Prize consists of a $10,000 check made payable to the winner. Who Are The Sweepstakes Winners? For the names of the winners, interested individuals should mail a self-addressed stamped business envelope to: Winner List, – Pilot Flying J Coffee and Cash Giveaway, P.O. Box 251328, West Bloomfield, MI 48325. Winner List requests must be received no later than August 28, 2018.